It is two years and counting as KRYPTONITE won their second 45 SPA WORLDS title AUGUST 19-23 at DALTON, GEORGIA’S HERITAGE PARK. In pool play they beat a pair of 3 5-year old teams WICKED GAME (20-7) and SPORTS ORTHO WICKED (9-6). It was a great way for KRYPTONITE to finish off the year which started by winning the SPA SPRING NATIONALS. Individual Awards went to: MANAGER-OF-THE-YEAR EDWARD BOUCHARD while Tournament MVP was CAROLYN DEEB. ALL-AMERICAN SELECTIONS went to COLLEEN SMITH, RHONDA “DODY’ CLINE, VERONICA “V” SHAW, DIANE “DJ” WHITE and VALORIE MULLINS. KRYPTONITE team members are: SMITH, APRIL BLAKE, CLINE, DEEB, SHAW, WHITE, VERBIA BEHE, SARA PAYNE, MULLINS, KAREN HUNGER, SONJA BROOKS-WHITE, SUNDAY WRIGHT and LORI LAMONT. 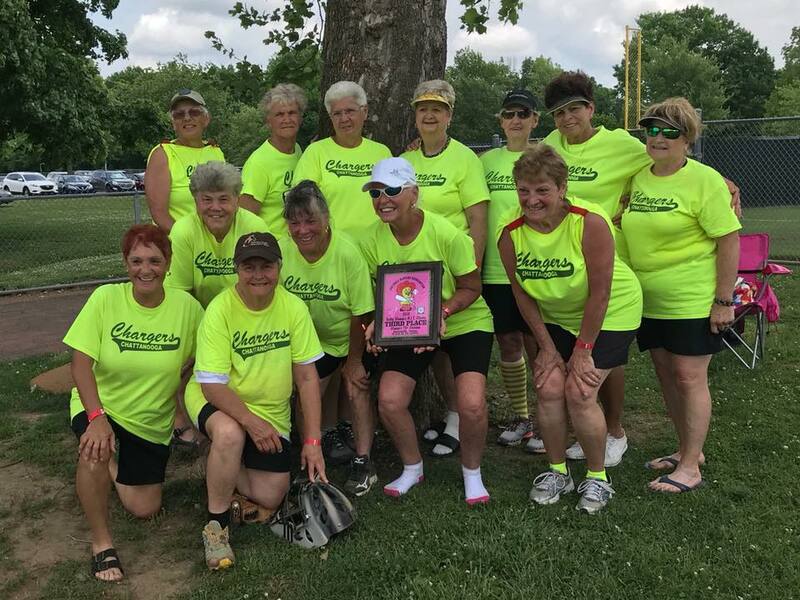 The SPA TWITTY SENIOR WOMEN’S NIT TOURNAMENT honored the 25thanniversary of CONWAY TWITTY’s passing with 33 teams participating in the tournament named in his honor. Held at DRAKES CREEK PARK ATHLETIC COMPLEX at HENDERSONVILLE, TENNESSEE the tournament saw an increase in teams from the previous year. Nine division winners were crowned during the event held MAY 16-20 with two teams EAST COAST GEMS (55) and GOLDEN GIRLS of VIRGINIA (70) the only repeat champion. Adding another 2018 tournament title after winning the SPA WOMEN’S SPRING NATIONAL, the GEMS also remained undefeated for 2018 taking four team 55 DIVISION crown. On the way to the title the EAST COAST GEMS downed the SLUGGERS (4-7), SERIOUS FUN (28-10) and SHO ME 24-8.. The SLUGGERS beat SERIOUS FUN 13-11 for runner-up honors. The GOLDEN GIRLS OF VA took their title beating the CALIFORNIA SPIRIT 20-5 and 18-8 as well as CHATTANOOGA CHARGERS 10-9. The. Bested the CHARGERS 17-8 for second place. The three-team 75 Crown went to the OHIO TRI STARS who beat the TENNESSEE STARS 22-4 and FREEDOM SPIRIT 10-2 in bracket play. The STARS beat the SPIRIT 15-12 to reach the finals. Four teams squared off in the 65+ group with JOLICO SENIORS 65’S taking home the top prize. JOLICO took care of the OHIO CARDINALS twice (11-10, 10-6) and SENIOR DIAMONDS 10-6 for the title. The CARDINALS dropped their first game in bracket play to JOLICO but fought back through the loser’s bracket beating DIAMONDS (12-3) and SMOKEY MOUNTAIN STARS (18-4) to reach the finals. The JOLICO 60’S followed their sisters’ lead winning the 60 + crown besting five other teams. JOLICO had a close call in the finals edging HAMEL LADIES 15-14 but had an easier time beating HAMEL 19-6 the first time around. The champs slipped by the NOR’EASTERS 13-10 in their opening round game. HAMELS beat SUNNY BEACHES 13-1`0 to reach the title game. MD ROADRUNNERS and SHO ME were the others in the bracket. TN SR STARS downed FIFTY CALIBER 20-8 in the “IF” game to take the 50’s division crown. The STARS lost 11-15 to FIFTY CALIBER forcing the “IF” game. In earlier bracket play the STARS beat FIFTY CALIBER 17-12 forcing them into the loser’s bracket. The STARS also beat FIRE and ICE 19-4, JWP AR MIX 18-4 and SUNNY BEACHES 17-12 in bracket play. ARKANSAS ENERGY defeated PITCHES BE CRAZY 40’S 14-13 AND 28-9 for the 40/45 title. PITCHES beat WICKED 21-18 to make the finals. MiIDWEST MAYHEM, SAVE 2ND BASE and PITCHES BE CRAZY rounded out the five-team bracket. The rain tried but it couldn't stop the 2018 SPA WOMEN'S SPRING NATIONALS April 14-15 at PENSACOLA, FLORIDA EXCHANGE PARK . "The weather tried but we were able to come up with results in all age groups," TOURNAMENT DIRECTOR MIKE DESORBO said. "We didn't get all the bracket games completed but enough games were completed to determine the winners in all five brackets." ARKANSAS JWP and Florida's HILTON FORTY PLUS were co-champs in the 35-division. Michigan's MIDWEST MAYHEM BALLERS , Kentucky's OUTER LIMITS, SAVE SECOND BASE of Tennessee and Alabama's PITCHES BE CRAZY were also in the six team bracket. The STAR of the 35-division was MIDWEST MAYHEM BALLERS PATRICIA ROE. ROE smashed a 300-ft over the fence grand slam home run. KRYPTONITE gave the home towners something to cheer about as the Florida squad took the 45 Division crown. ARKANSAS SYNERGY nosed out TM FORCE, Florida for the 40 bracket title Tennessee's BATGIRLS RETURN was the third team in the bracket. The 50 Title stayed in Florida as FLORIDA GIRLS came home ahead of ARKANSAS's runner-ups JWP and third place finisher FIRE AND ICE of Tennessee. H TOWN SISTERS WITH BATS (Texas), JWP AR MIX (Arkansas) and PENSACOLA SENIOR LADIES rounded out the six - team group. EAST COAST GEMS (Virginia), THE PLAYERS (Florida) and SUNNY BEACHES (Florida) finished 1-2-3 with the GEMS taking home the top prize in the 55 group. SHO ME (Missouri), SERIOUS FUN (Tennessee) and LA SPORTS also participated in the six-team bracket. "It was the best tournament we ever held here in terms of competition and quality of the teams," DESORBO said. "I just wish we could have gotten all the games in on the last day." Kryptonite used its “powers” to win the SPA 40/45+ World Championship September 23-23 Heritage Point Park in Dalton, Georgia. Kryptonite beat Bat Girls Return two-out-of-three for the title as others in the age group did not wish to match talents with the top two teams in that age bracket. At Dalton It was an even battle until Bat Girls Return couldn’t get their wings going in the rubber game losing 20-2. The teams split the first two games with Kryptonite winning 20-16 and losing 8-16. The champs have won six out of seven tournaments they have played this year. “Most of us have been playing together for twenty + years,” Shaw said. “We also have been fortunate to have Ed Bouchard SPA 40/45 Manager-of-the-year coaching us. He is the biggest asset to our team". It isn't only softball on the team's mind as they promotes Autism awareness on their uniforms, especially the jerseys. Valorie Mullins was the tournament MVP, she was 16-for-17 at the plate. Selected to theAll-American All-Tournament team were: Colleen Smith, DJ White, Sara Payne, Karen Hunger and Shaw. Members of the Kryptonite team are: Smith, April Blke, Rhonda Cline, Carolyn Deeb, Theresa Walburger, White, Verbia Behe, Payne, Mullins, Hunger, Sonja Brooks-White, Lynelle Westra, Shaw, Coleen Dague and Bouchard.